To retrieve data from two tables where no common column between two tables such thing is called Non Equi Join. Now we are retrieving Employee data with Grade. 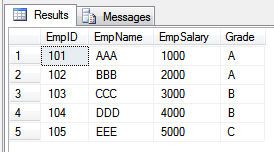 Here no common column present in both Emp, SalaryGrade tables.